Despite half a century of biblical interpretation that has sought to put women back on the agenda of ancient texts (written largely if not wholly by men), the dominant threads of narrative and doctrine have—with the notable exception of Mary the mother of Jesus—been focused on the lives and actions of men. Reception history tells a different story. It is not the case that there is a recovery of the lives of women hidden behind the pages of the New Testament, for our information remains as sparse and tantalizing as ever. Rather, the study of biblical women’s ‘afterlives’ allows the imaginative engagement of artists and writers to broaden the horizon of interpretative expectations. Whether it is through historical imagination or the grasp of different portrayals of familiar biblical women (like Mary the mother of Jesus or Mary Magdalene), the creative genius of these interpreters, neglected by mainstream biblical textual scholars, only underlines the importance of the biblical women, viewed in the light of their afterlives. 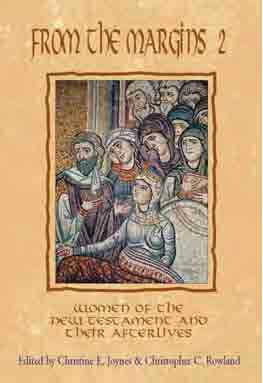 This volume has its origins in a project entitled 'Biblical Women and their Afterlives' conceived and developed by the Centre for Reception History of the Bible at the University of Oxford and organized together with colleagues from the Luce Program in Scripture and Literary Arts at Boston University, USA. This project resulted not only in the present interdisciplinary collection of 21 essays (with their 66 illustrations) but also its companion volume From the Margins 1: Women of the Hebrew Bible and their Afterlives, edited by Peter S. Hawkins and Lesleigh Cushing Stahlberg. The present volume includes the specially commissioned poem ‘To Cast a Stone’ by the acclaimed Irish poet John F. Deane. Christine E. Joynes is Co-Director of the Centre for Reception History of the Bible at the University of Oxford. Christopher C. Rowland is Dean Ireland Professor of the Exegesis of Holy Scripture at the University of Oxford.